Fionta provides Google Analytics assistance to our clients – either as part of a website redesign project or on an adhoc basis. Google Analytics is used to track all user activity on a website and is an invaluable tool to track the success of campaigns, keywords, events, and goals. 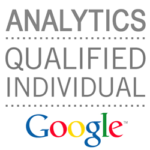 Our staff, Google Analytics Qualified Individuals, have deep expertise setting up, managing, and training clients on the use of both Google Analytics Universal and Google Tag Manager. Fíonta works with our clients on search engine optimization and we treat the SEO process with a holistic respect. SEO is not merely a phase of the project—SEO best practices are part of every aspect of a web design project. Additionally, we can assist clients with keyword research using a proven five-step methodology to generate keyword ideas, test and validate those keywords and track page rank change over a set number of weeks/months. Fíonta has assisted clients with blog writing and implementation and the creation of keyword specific landing pages to increase page rank on specific keywords.